Since becoming a part time teacher, full time parent, I, every now and then, take a look at myself in the mirror and remember the person that I used to be. The person I was before I had children of my own. The person who, on a regular basis, slept more than a few hours a night, and went shopping for her own clothes, rather than small ones, and the person who had time to straighten her hair on a regular basis before dashing out of the door. I miss some of being that person. An occasional lie in would feel amazing, and it would be nice to go out for the evening without worrying about whether or not the children will wake up while I'm not there. I'd love to get my guitar out and twiddle unhindered, without a small audience, or indeed, sit on the sofa and read my very own book. And yet. Yet. I couldn't go back. Ultimately, she could, and did have to, put other children before her own. And, while some professionals manage to do that very well, and I have a great deal of respect for them for exactly that reason, I am not in that place. Not yet, and perhaps not ever. Part time, or rather supply teaching appeals to a lot of mothers of toddlers and young children. It allows them to exercise their professional skills and still be there for their children, and that appeals to me immensely. Here's why. 1. Teaching can be all-consuming. I remember a colleague telling me the story of how her son used to say “You love your children at school more than me,” and I used to promise myself that I wouldn't be that mother. I want to be the mother who is present while my children are small enough to appreciate me. There is time enough as they grow up to change my mind. 2. And…children grow up so fast! Blink and you miss those first few milestones. I have been fortunate enough to be able to see both my children take their first steps, and hear them say their first words, and develop an amazingly close relationship that makes my heart happy. My husband, on the other hand, has often been at work, because that has been the practical arrangement in our household. I remember the times he has, he thought, spotted something new, and it's actually not. His face says it all. I'm so glad that I have had that opportunity. Many parents do not. 3. I'm sure it's not in any doubt, but once you have children of your own, they have to become your priority. I think one of the hardest things to deal with as both a parent and a teacher is guilt. That we're either letting our families down, or we're letting our class down. Sometimes both. They are all children, and they all do, and all should, matter. I think as a parent with a young family, it is easier to give of yourself in small bursts, preserving much of yourself, and your time and energy for your own children. It's difficult to balance and weigh up what is important, but supply teaching provides the space to do just that. 4. One of the things that we have had to do as parents is to prioritise what our needs as a family are. We've thought long and hard about things we can live without (my husband's annual travel pass has bitten the dust, and he now commutes by bike). Holidays are few and far between, but less expensive experiences with us as a family are abundant. We make savings where we can, but of course, we are also in tune with the ever changing needs of our family. Once again, supply teaching has advantages for us at the moment for this reason. 5. There are days when, as a parent of young children, you just aren't at your best. Illness, tantrums, sleepless nights, all take their toll. There are days when you're glad of an opportunity not to have to dress for the day ahead and put your best foot forward. Not, of course, that you can just go back to bed and hide under the covers when there's no call. Or this: Show Me Show Me Skills! When Classpeople agreed to review this six part course we had hoped it would be packed with useful learning tools and success tips and we were not disappointed. What we hadn't expected was an all-round supply teachers’ guide to working, something to keep in your supply bag for reflection as a ‘self-check’ manual. Starting with the basics which, quite ironically, are the first things we forget, this CPD course will walk you step-by-step through your supply plan. It will give you a tool belt to ensure that you are ‘armed and ready for battle’ whilst holding your hand and providing constant support. Success tools such as links to additional information on each module mean that the participant is not ‘overwhelmed’ with information but still has the ability to delve deeper in to areas of interest or concern. Inclusion of video links to relevant content allows the brain to shift and provides visual inspiration. I particularly liked the idea of having a person in mind when approaching the type of person you would like to become to actively target the desired behaviours and create the skillset and confidence required. Inspirational quotes help lift the segments and reinforce self-belief for any self-doubters and the gentle coaching language style helps make the reader feel secure. Self-analysis forces the reader to take responsibility and many of the development skills imparted could easily be adopted and applied to sectors outside of education. Taking this course will help supply teachers learn how to create a seamless education environment whilst flexing their creative muscles and getting stuck in. A must for any supply teacher starting out and highly recommended even to the more established supply teacher. "Having reviewed the CPD course literature I am delighted to write a prognosis of my findings. It is extremely clear from the start that this literature is well written and set out and guides new supply teachers in a direction which will allow their confidence to grow throughout their journey into the supply world. In my 12 years’ experience, I have seen supply teachers coming into the world of supply and finding it very different and simply not preparing themselves enough and without guidance like Sharon and her team have put together, some sadly, walk away from supply. Other than guidance from an agency, there has never been any real information to prepare anyone joining the world of supply in our schools. Therefore I am extremely proud to be asked to view this literature. Once I started reading through these well-presented bite size pieces of self-study material, I found myself engrossed and was unable to put this down. I have to say this is possibly the most informative, and only study material any supply teacher will ever need, it offers guidance and strategic advice that not only would benefit the supply teacher, whilst building their confidence in the classroom as a supply teacher but will also be extremely beneficial for anyone else in the world of education. We all know being a supply teacher in school is not the easiest, however this CPD self-study will give results whilst building on the confidence to really believe in yourself. I would highly recommend this CPD self-study course to supply teachers and I would also recommend this information be kept in all staff rooms in schools for any supply teachers to view. Well done on such a fabulous tool that I will be recommending to all of my present and new supply teachers coming on board." "Being someone who went from supply staff to agent, I was interested in reading the CPD course. I was sceptical about the amount of information that would actually be of use. I needn’t have worried. The course is easy to follow, well laid out and packed with information I wish I’d been privy to at the start of my supply life. There are tips and tricks for things that it took myself and others I know 2-3 years to find out on our own. The course is interesting and engaging, and makes no assumptions of the reader. Only that the reader is willing to learn and do so at their own rate. I flew through my first reading, went back for another more in-depth read, and will keep this as reference for a long time to come. Obviously the information is intended for supply teachers and support staff. There is so much information though that it extends beyond that. Appearance and time keeping for instance are 2 things I will be working on in my private life as well as professional. I was fortunate enough to land a very good agent when I started supply. Some do not. This should be on the read list for agents too. For teachers the sections on agencies and building your relationship with agents and schools, contacting them etc. is most useful. It informs about the ‘business’ of supply teaching rather than just what happens in a class room or school. I think most people will find this an enjoyable read and not just a dusty CPD with bland information. The sections are set out in a self-study, self-evaluation format, it’s full of fun and inspirational quotes that reflect on the current topic, and while there is a definite linear flow, it’s very easy to reference different topics and dive right in. If you are new to the world of supply, then this is invaluable information. A must read. If you’re a seasoned pro, then still read this as there will be something there for you. Anyone in between, you guessed it, read this CPD. Seriously, it’s as much about self-improvement as it is supply teaching. There is something for everyone. A Swiss army knife of techniques, tips and tricks to help anyone in the world of supply. We all have days when we struggle, some more than others, but this will help you be more rounded in your supply career. As you may have guessed, I highly recommend the CPD course. 5 stars from me. Well done guys." "It is with pleasure I review your CPD Course for Supply Teachers. Having worked with supply teachers for more than 6 years through my business Smile Education, I understand that a lack of CPD and training is often a big frustration in our industry. So I commend you on providing such an excellent and cost effective solution which starts right at the beginning of the teacher’s journey into supply and makes no assumptions about their previous knowledge, personal attributes or skills. Being able to work through at your own pace would be of great value to our staff many of whom lead busy lives with family and other commitments in addition to work. Right from the introduction I felt that the supply teacher was being supported and empowered to achieve the very best that they can. As I worked through the modules I enjoyed the supportive conversational style and the relevant and practical activities, each of which I could see had real life value and encouraged not just practical action but also important reflection on skills, abilities and potential weaknesses and how these can be practically overcome. I can see that you have provided tools to help combat all the common niggles and complaints we get from schools and supply staff! The modules about being personable and proactive are exceptionally relevant and not obvious if you had always been in a permanent position before. The format of each module is easy to follow and interactive containing a balance of the authors own thoughts and experiences alongside external research and additional reading. Video links are also included which adds great variety to the material. I particularly like the modules around behaviour management and it not being a given that students misbehave for supply staff. (I hear this pretty much daily from schools!) I think changing this mind set is hugely powerful as is being absolutely clear on your own expectations and the rules that the children are all familiar with every day. I liked the chance at the end to reflect over each module, I think this is very important to ensure training is applied practically and not just enjoyed in theory. I personally always give myself 3 actions from each training module I do which I keep in a central book and review on a regular basis. I would love to see more training available as teachers progress through their supply career and encounter various challenges. Congratulations on putting together a great resource for supply teachers which I thoroughly enjoyed reviewing!" CPD for Supply Teachers drew me in immediately and kept me engaged until I'd finished all of the six modules. The information is clear, straightforward and honest, it promises nothing more than the truth that Supply Teaching and becoming even better at it requires hard work and commitment on the part of the individual. The activities, and particularly the end of module essays really encouraged me to reflect on what I'd done in the past and what I could do now, and into the future, to develop both as a teacher and as a person. I really liked the emphasis on the fact that supply teachers are teachers first; that "supply" is the way chosen to do that teaching shouldn't make any difference to the professional outlook of the individual. This is an excellent course for anyone working with children not just supply teachers and the authors should be commended for approaching the subject in a way that invites participants to engage right from the get go and well beyond the end of Module 6. "I decided to undertake this course as I was preparing to get back into teaching this new school year. I have been out of the classroom for over two years, having had my confidence knocked, and so I was feeling rather anxious about returning. I happened to see this course advertised on Twitter, and, at a very reasonable price, decided to give it a go. I can honestly say, I am so glad that I did! I was informed by Sharon that this would be the perfect study course to undertake prior to getting back into teaching and my first experience of supply. I was worried that this was something that I would only be able to complete whilst actually doing supply work, but this wasn’t the case and I was able to work my way through it over the summer, working at my own pace, ready for the new school year. The payment was quick and easy (via Paypal) and was simple to download. I then started work! On first glance at the modules, I could see that the content was going to be just what I needed. I was particularly looking forward to the ‘Building Self-Confidence’ module, as this was a big concern of mine. I felt as though all the modules were very appropriate and targeted at the issues and concerns that most supply teachers are worried about or need advice on. Once started, I found the modules really easy (and sort of addictive!) to work through. The modules were clearly set out, with the aims and objectives listed at the beginning and a summary at the end. The activities were well suited and easy to understand and I was really impressed with the further reading that was suggested at the end of each module. All the activities were varied, and I found that by working through each one, I was realising and thinking about things that I hadn’t even considered. I found the activities made me think, not just about myself as a teacher, but also myself as an individual. There were lots of hints and tips and each module was very easy to read and work through. I particularly liked the end of module essays, as I felt they brought each module all together and really made me think and realize what I had learnt during the course of the module. Some of the activities were a little challenging, but in a good way. I found some difficult to get into and had a case of the writer’s block, but once I started, I found that I had a lot to say! I was impressed as to how quickly Sharon was to reply. She was so supportive all the way through, from my initial enquiries to the feedback I received. I feel like this course has opened up a network of fellow teachers and resources that I can go to when I need some support, advice and inspiration. The whole course has encouraged me to get back into ‘teacher mode’. I have never done supply before and now I feel I know the kind of skills I am going to use and improve before starting. I shall be showing the agencies my certificate. I cannot recommend this course highly enough, especially if you are feeling anxious about undertaking supply work. Thanks to Sharon and this course, I now feel so much confident and ready to take on the challenge of supply teaching. Bring it on!" CPD for Supply Teachers: A 6-part self-study course for supply teachers in any Key Stage has been specially developed to aide those new to supply teaching, or those who feel they lack confidence in the classroom as a supply teacher. "…I cannot recommend this course highly enough…"
"…drew me in immediately and kept me engaged until I'd finished all of the six modules…"
"…I commend you on providing such an excellent and cost effective solution…"
"…A Swiss army knife of techniques, tips and tricks…"
"…possibly the most informative, and only study material any supply teacher will ever need…"
"… a tool belt to ensure that you are ‘armed and ready for battle’ whilst holding your hand and providing constant support…"
"…such a valuable resource for the often undervalued supply teacher…"
The last week of the month (possibly the third week if I've been a little careless) always brings with it a little fear, I am afraid I might go overdrawn. It is a genuine fear, borne out of historical actions, debts and bills. It's quantifiable, somewhat avoidable but there all the same. The anxiety that comes with it, that's a whole new story, I build that on the rocky foundation of fear, but fear and anxiety are very different. When you climb up the ladder of anxiety you get from the bottom rung of perhaps not having enough to cover bills, right to the top rung of losing your home and being penniless and in the streets quicker than you can physically climb. It may sound extreme but as you climb up the ladder with the speed of a ninja warrior (or worrier), you get to the top, the worst rung where life has collapsed and there is nowhere to go. Except down. Imagine all the skills you have for the classroom; reasoning, knowledge, bringing life to life, conflict resolution, rationality and reason. It is this emotional resilience that you will teach others as second nature that is often very difficult to apply to yourself. 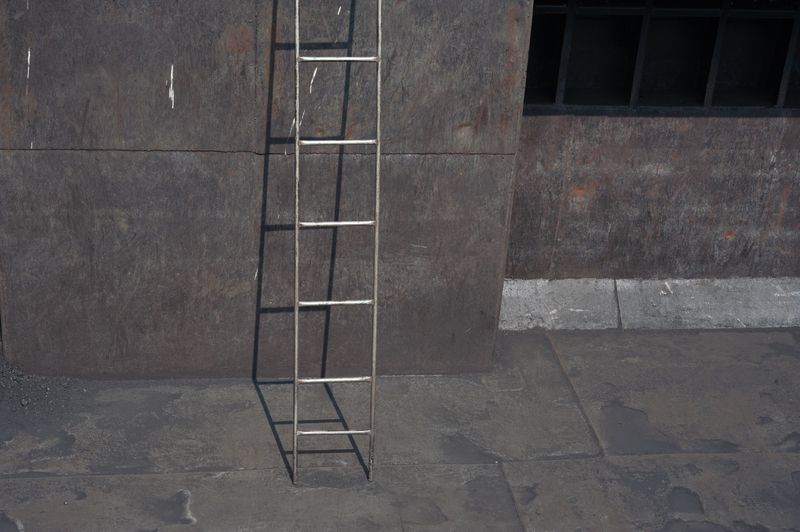 On the top rung of the anxiety ladder, worried and wobbly, reasoned argument can feel a very long way away. Take some deep breaths and step down a worry. Think realistically, how have you managed before, what is within your control, what is real? What do you need help with and what can you do yourself? Any situation of anxiety is fear pushed to the extreme limits, stretched beyond reality and mixed with a massive blob of negative imagination. Worst case scenario shouted in capitals with some exclamation marks at the end. But how often does the worst of what we imagine actually greet us in reality? Have that thought in your mind as you step down a rung. What proactive things can you do to make calls come? Step down a rung. What could you do with a day at home? Plan and cook some cheap meals, make some realistic plans, step down a rung. Hold what you can in your hands that is within your control and work or what you can do with that. The things out of your control need to be let go of as these cannot be changed. Step down a rung. Deep breaths, reasoning, and the top of the ladder may seem quite far away. Explosions of worry and anxiety are part of life. How we negotiate with ourselves once we are at the top of that anxiety ladder will determine how well we manage to deal with the day to day worries that arrive. Keeping things real and rational will save us the exhaustion of all that climbing and give us time to be in control. And that's when we get things done.